Have you ever felt overwhelmed or confused by your prescriptions, or simply wished there was an easier way to keep track of them? Medicine On Time® is the answer! After you enroll, all of your prescriptions will be delivered to you already separated out by day for the coming month. 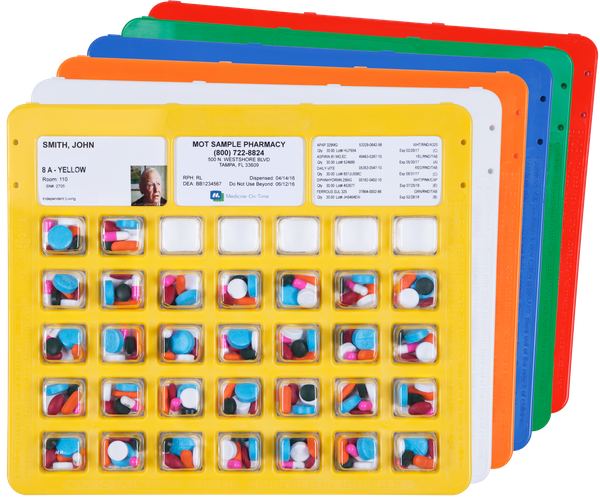 Each color-coded calendar card card is personally prepared by your pharmacist. Each personal dosage cup contains exactly the pills you need to take and is clearly labeled with the contents and the precise time to take them. It’s that easy. Your pharmacist will synchronize your Medicine On Time® account so that your medication arrives exactly when you need it to: no more last-minute trips or waiting in pharmacy lines. And if you’re going on vacation, don’t worry about counting out pills: just take out one dosage cup for every day you’ll be gone. Medicine On Time® is also available for delivery to nursing homes and assisted living facilities. Gone are the days of paper cups filled with confusing pills, or medication accidentally taken without food or at the wrong time. Sign up for Medicine On Time® at Walsh Pharmacy today, and say hello to the right dose at the right time, right at your fingertips. Please contact Melanie at 508-679-1300 or email us at walshbes@aol.com for more information.